There is an area of Massachusetts that is south of me and about a two hour drive called Swansea, MA. I have had my eye on this area of Massachusetts because it is so close to Rhode Island and there are a lot of ocean inlets and rivers around the town that drain into the ocean. 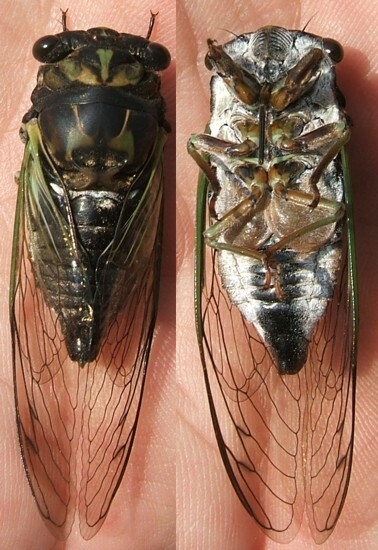 This area seemed ideal for two species of cicadas that are found in other areas of New England, that love areas of water and sandy soil and may just be in this area. Those two species are Tibicen chloromera and T. auletes. The above mentioned species are not known to be wide-spread throughout Massachusetts but I thought this area would be ideal. Unfortunately, nothing could be further from the truth. The only species of cicadas that I was able to hear was Tibicen lyricen of which you guys know I just LOVE. I was able to determine this only by driving around the town of Swansea in my car. Everywhere I tried to go, there was nothing but private property so my access to places was extremely limited. However, I was able to enter a local cemetery known as "Mount Hope Cemetery". It was fortuitous that I stumbled upon this cemetery because it was over-run with cicada killers (Sphecius speciosus). I focused on a particularly busy area where there seemed to be a ton of male cicada killers flying around and where there were about 20 burrows. 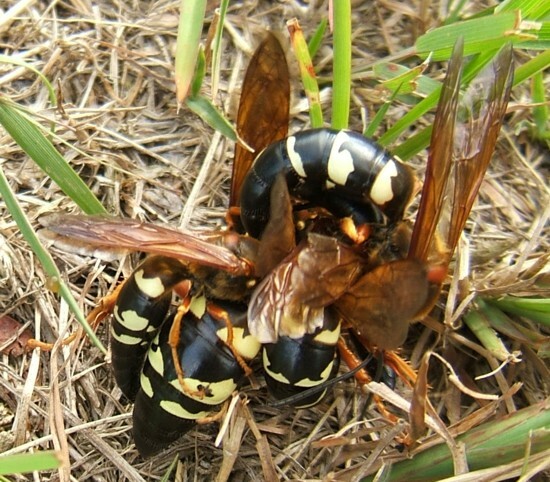 I heard a helluva ruckous going on in the grass that sounded like a bunch of angry bees and what I was able to discover was just a big ball of male cicada killers rolling and tumbling around in the grass. 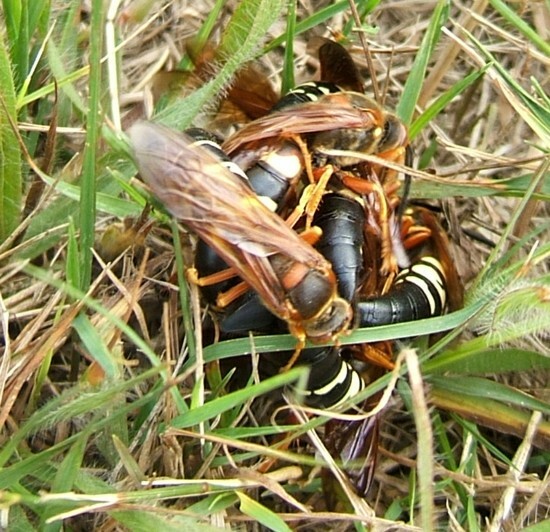 From what I learned from Professor Chuck Holliday of Lafayette University in Pennsylvania - he studies cicada killers and I help gather data for him - I knew that somewhere under that pile of male cicada killers was a female that all these males were trying to mate with. This being my third year in studying these insects this was the first time that I have witnessed this amazing phenomenon. It was like a bunch of 10 year olds all in a giant "pig-pile". Some males would fly off but only to be replaced by other males. Other males would fly away only to return at a different angle to try to gain a better purchase on the female. I watched these guys for about 30 minutes then decided to drive around. I was gone for about an hour. When I returned, the mating frenzy was over. 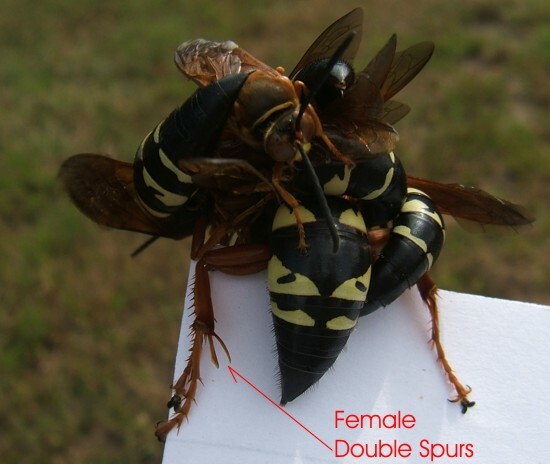 I would assume that one of the males was successful in mating with the female. 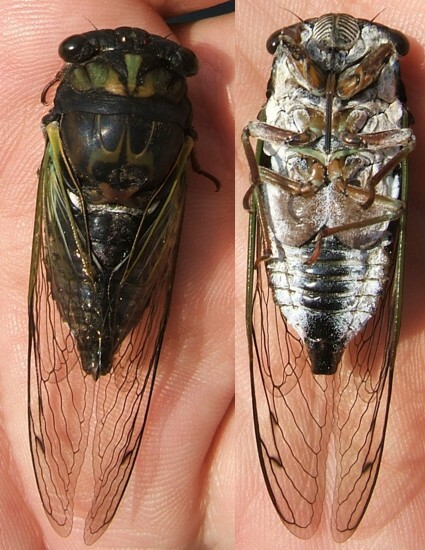 I even noted several different male and female cicada killers that were flying around encopula (connected via the genetalia). Click the thumbnail to the left to watch a brief movie of the frenzy and the competition involved between all these males as they try to mate with the female. 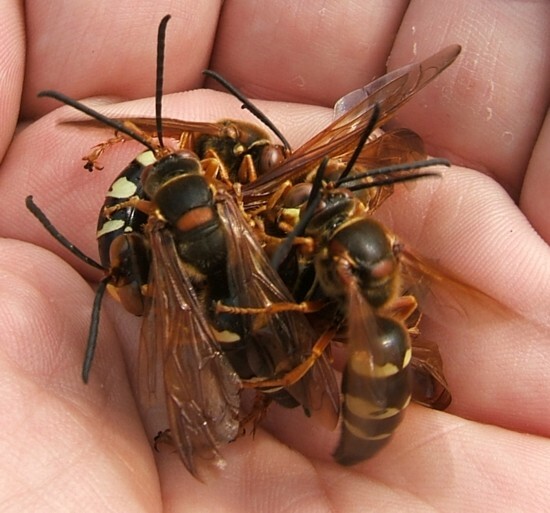 These Wasps ARE NOT Your Enemy. I get a lot of email from people who are only too happy to provide data about cicada killers that they have at their locations. But most after providing this information via the online form, ask how to get rid of them. First of all, I'm not about the eradication of Cicada Killers, I'm about their study and observing their behavior. They are truly an amazing insect so please do not ask me how to get rid of them. You might as well ask me the best method to kill a baby seal. It just isn't going to happen. 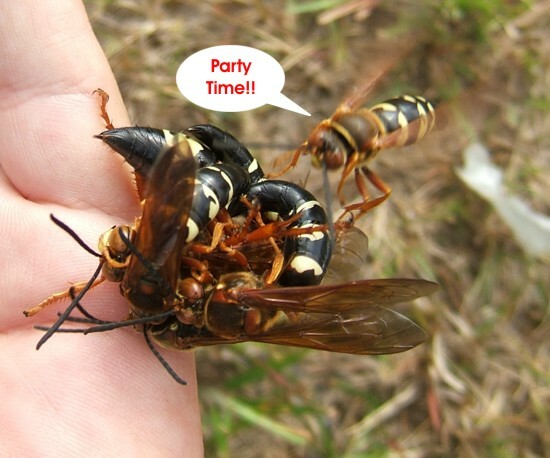 To prove my point as to this wasp's docile nature, take a look at this first photo. 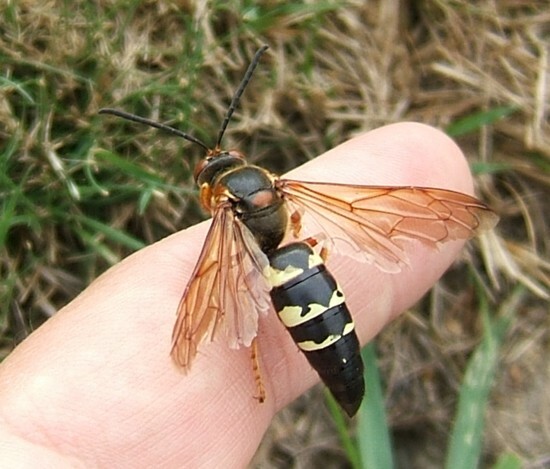 I offered this male cicada killer my finger to perch on. It happily sat there for at least 10 seconds then went off to chase another male. I even mustered up enough courage to pick up that ball of mating cicada killers knowing full well that there was a female mixed in there somewhere. But still, I never had a problem. Even with this ball of cicada killers in my hand, males were still coming and going, landing right in my hand to try to get in on the action. Click the thumbnails below for a closer look. 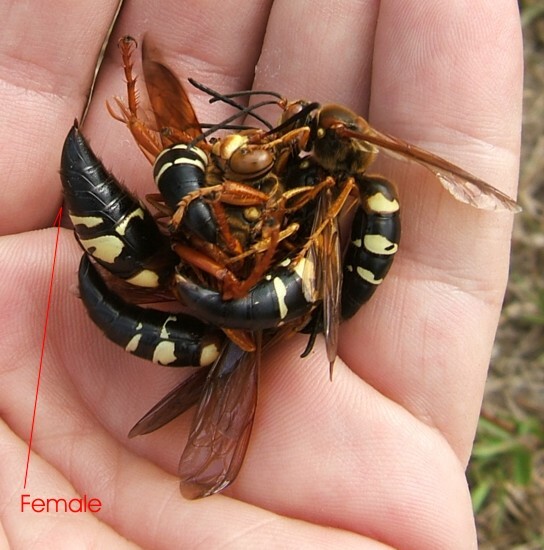 Determining Male from Female Cicada Killers. "You can tell females from males by the large pair of spurs at the junction of tibia and tarsus on the last pair of legs on the females only. They also have one less segment in their antennae and abdomens than the males do, but this is harder to see. About 10% of females are in the males size range, but 90% are larger than males." So taking the large size out of the equation to allow for those 10% of females that fall into the size range of males, that leaves for a sure identifying factor the spurs at the junction of tibia and tarsus as Chuck mentions above. Click the thumbnail to the left to note the large size spurs on a female. Even in this picture this particular female is much larger than the male counterparts. The male does indeed have small spurs compared to the female. Click the thumbnail to the right for a closer view. It is believed that the female's larger spurs may help in moving the dirt around during the excavation of its burrow. I also believe that these larger spurs may actually aid the female cicada killer in carrying the stung and paralyzed cicada prize. Let the Females do the Work. Since it was incredibly hot and humid this day and my access to lands in Swansea were extremely limited due to the "No Trespassing" and "Private Property" signs everywhere, I decided to fall back on my other plan in obtaing cicadas in new areas. That plan is to stake out a cicada killer lek and watch to see what the females bring in for species of cicadas. 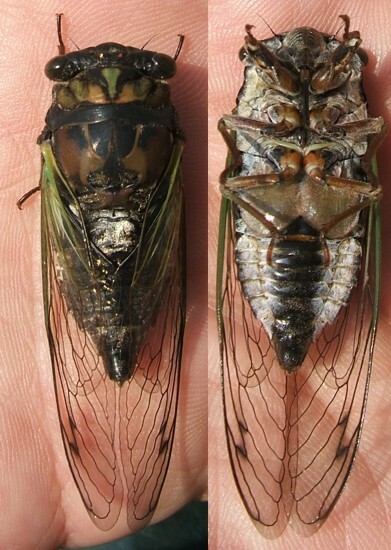 This gives an idea of what cicadas are readily available in the area. It would seem that these cicada killers were bringing in nothing but Tibicen lyricen cicadas which proved somewhat what I was hearing calling in the trees. 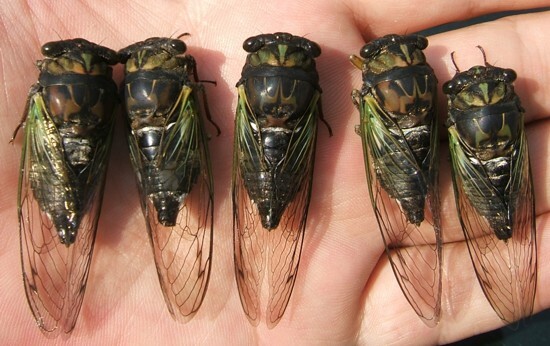 What I found really strange was that these females were bringing in only male Tibicen lyricen cicadas. Out of 5 specimens that I snatched away from the females, all 5 were male!! Note that one of the males (2nd from right) is actually only a few hours from the teneral stage. 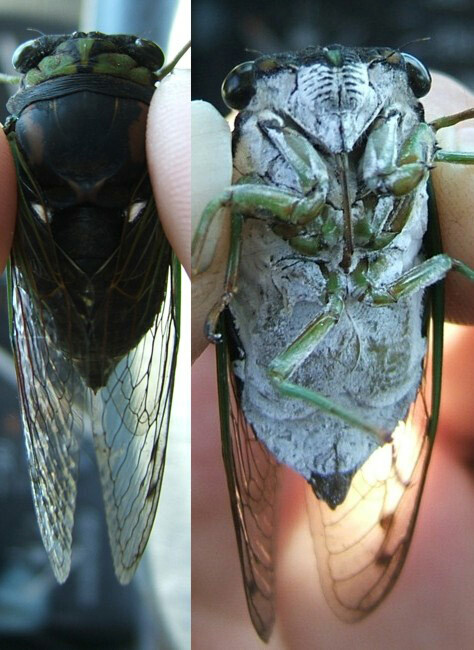 I have noted this previously last year where a cicada killer female actually took a paralyzed T. canicularis teneral no more than an hour from completing the molting process. You can see the differences in color patterns and different degrees of pruinosity in the above 5 specimens. Even in the group photo to the right. Click the thumbnail to enlarge. 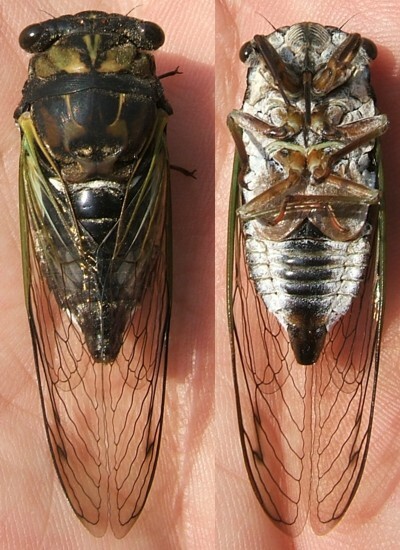 It's these slight morphogical differences which often confuse people greatly when attempting to identify cicada species. 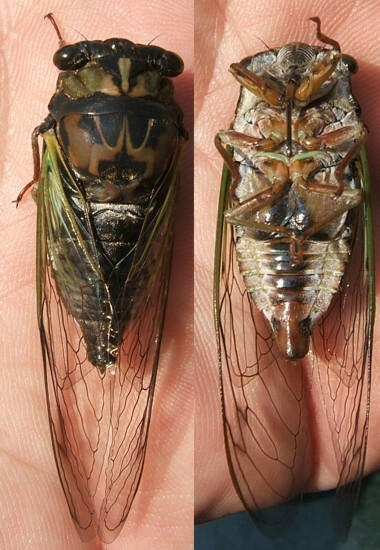 However, in all 5 photos above, there are two constants which help in keying the cicadas as T. lyricen and that is that the pronotal collars are all black and there is the black medial band that runs the entire length of the underside of the abdomen. I did notice that upon my return to the lek, that there was a lone female crawling along the ground but as it was crawling it was kind of scraping the tip of its abdomen along the ground as while walking. This is where the genetalia are located. It did this for about 5 minutes then flew off. I can't help wondering if this is some sort of behavior that females exhibit shortly after mating and that maybe this female was the one from the "mating ball". I will have to ask Chuck this question when I see him in a couple of weeks. All I know is, that the female really seemed to struggle during this frenzy and I'm sure it is a very exhausting and perhaps even traumatic experience. them in my lawn?We have had them for about 4 years.Why do they not locate 8 feet to my neighbors yard?What attracts them to my yard?I"m trying to understand this better.I've read your articles on line. Technically the reason why they come back to the same place every year is that they really never left. 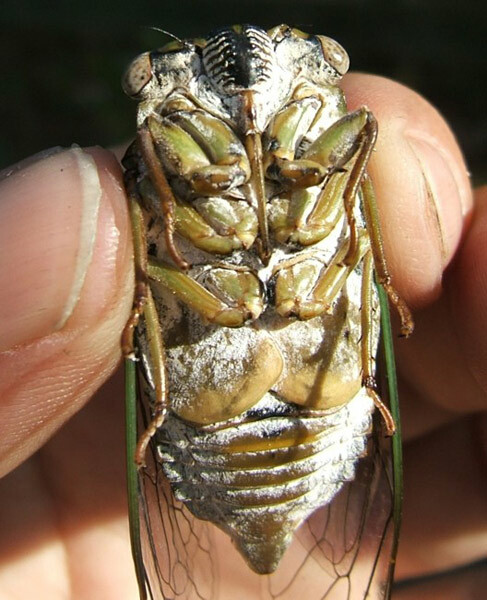 You see, it is the offspring of the female cicada killers that laid the eggs the year before. I'm afraid that without some drastic measures which include digging up your lawn in the fall to remove all the underground burrows they will be there year after year. The conditions of the soil ie; sandy makes it easy to dig burrows as well as adequate sunlight are probably some of the reasons why they like your yard. As the years go by they may in fact spread to your neighbor's lawn if it has the same conditions as yours. 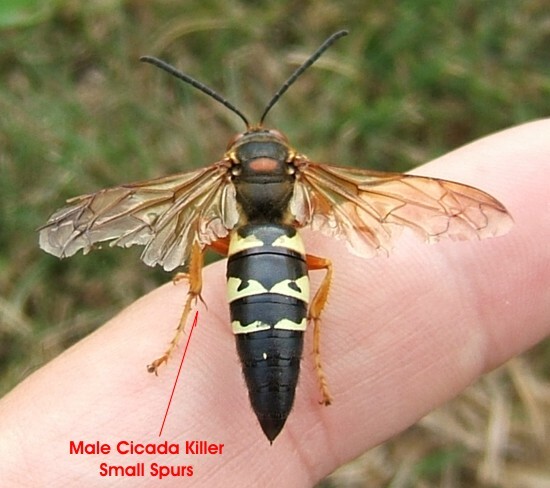 The cicada killer females generally disappear probably around the end of August into September after the females have collected enough cicadas and laid their eggs. markings are different,and I have witnessed them collecting pollen from flowers.I have been watching them for about 10 years now ,and I have noticed a lot of drastic changes in behavier and apperence.